As you guys know, I moved back to my home state of Michigan in December, and since then I have been exploring and appreciating it as much as I can. One thing I’ve wanted to do for years is attend Grand Rapids ArtPrize…but the whole living in another country thing kind of got in the way. Each year my mom would go and then send me photos of her day, and I was just so so jealous! This year, though, I made it happen. We drove over to Grand Rapids for the first full day of ArtPrize and it was really everything I dreamed it would be. I’m so proud of Michigan for this totally unique and special art festival, that is attracting both international artists and international travelers! In this little guide I’ll be sharing what Grand Rapids ArtPrize is, our day at ArtPrize, plus important details like where to eat, and how you can attend, too! You can also scroll to the bottom of the post for a downloadable map. One of the installations… these are all speakers covered in food (sprinkles, alphabet noodles…)! 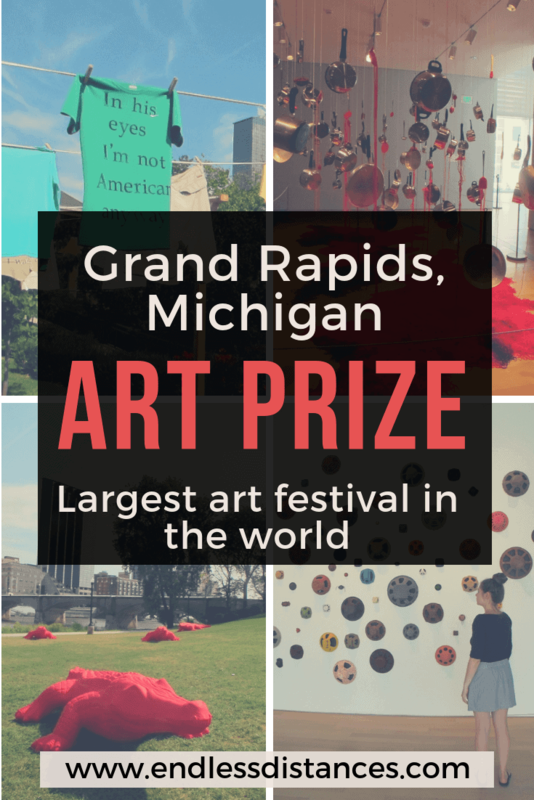 What is Grand Rapids ArtPrize? Grand Rapids is one of the biggest cities in Michigan, located on the west side of the state. It is home to ArtPrize which is an outdoor art festival that lasts for a little over two weeks throughout September and October. In 2014 and 2015, ArtPrize was the most attended public art project in the world. What makes ArtPrize so special and different from other art festivals, though? First, the art from ArtPrize is installed all across the city. I mean not just in museums (although there are lots of ArtPrize installations there too), but in coffee shops, hotel lobbies, street corners, bridges, underpasses, even in the middle of the river. What makes Grand Rapids ArtPrize really unique, though, is that it is a community engagement project. The most prestigious of the ArtPrize awards is given based on a public vote. Basically, you go to ArtPrize, enjoy the art and exploring the city, and then vote for your favorite on the app or the website. 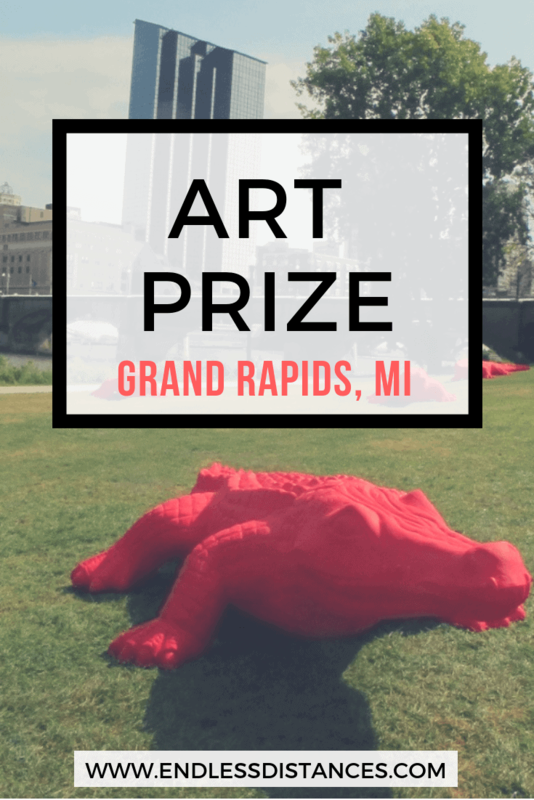 How to get to Grand Rapids ArtPrize? If you are based in Michigan, you can attend Grand Rapids ArtPrize as a day trip, like I did. There are lots of parking garages in Grand Rapids where you can park, such as Pearl-Ionia (ideally located!). From there, the city is easy to walk around (this is what we did). If you want to travel further afield, or don’t like walking as much, you can also use the DASH people mover. However, not everyone can come to the Grand Rapids ArtPrize as a day trip, obviously. I recommend making a weekend of it if you can! Grand Rapids is easily reachable by car, Amtrak train, Greyhound bus, or even by air (you can fly into Detroit International Airport or the smaller airport in Grand Rapids itself). Amway Grand Plaza – Centrally located with some of the best ArtPrize installations located in its lobby! JW Marriott – A classic hotel and reliable brand, overlooking the river. CityFlatsHotel – Has amazing eco-friendly and local Michigan initiatives. This is my pick! StayHostel – I mention this but the hostel is currently in startup mode and set to be the first and only hostel in Grand Rapids. Hopefully in future ArtPrize years this will be a more affordable option for accommodation. Or for a more local feel, use Airbnb. If this is your first Airbnb you can use my discount code for $40 off. Onto the good stuff… our day at ArtPrize! My mom and I chose the first full day of ArtPrize to roadtrip over the Grand Rapids. There was a massive thunderstorm at 7am so we almost canceled… but decided to go through with it. It poured our whole drive up but the sun came out as soon as we arrived! I think we actually got lucky because ArtPrize wasn’t too crowded due to the sneaky weather. Our day started off with parking at Pearl-Ionia parking garage, and checking out Rosa Parks Circle for the ArtPrize visitors tent. I recommend this as everyone’s first stop because you can get a map, the lay of the land, some free swag, and register for the app so you can vote for your favorite art installation! We meandered our way around, admiring art on the streets and sidewalks. There are big sandwich boards saying ‘ARTPRIZE’ in front of any building that houses an ArtPrize project. We popped into an icecream shop, a coffee shop, and an olive oil shop which all were hiding ArtPrize projects. A piece on a street corner! A big theme I noticed this year was recycled scrap metal. Our first major stop was Amway Grand Plaza which usually has a few projects in its lobby. 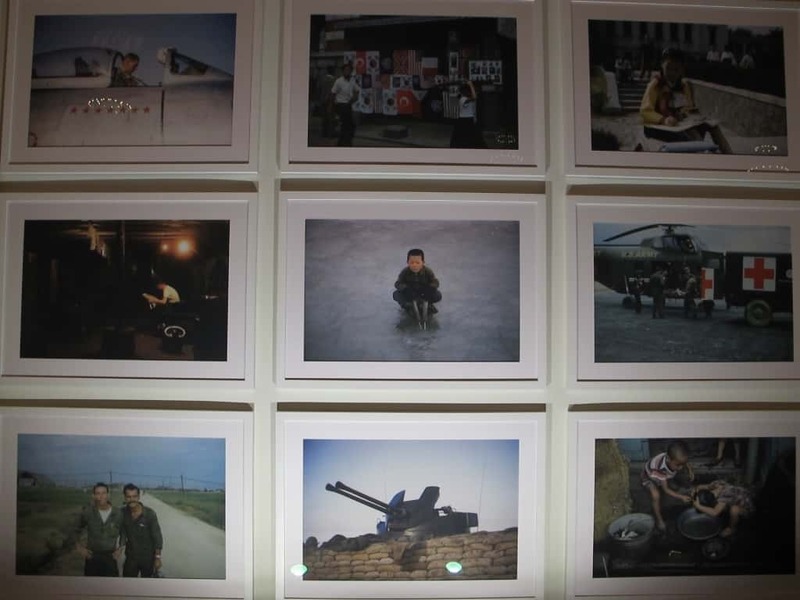 This is actually where I saw my favorite project of all… a series of photographs titled ‘The Forgotten War.’ They were nine rare color photographs that the artist took during his time with the army in the Korean War. The artist is now 85 and only recently recovered his photographs. They were just so beautiful and stirring and really impacted me as my own grandfather fought in the Korean War, and I am now working in a dementia care unit with patients who fought there too, and decades later are still dealing with the emotional aftermath. On the west side of the river, we stopped by Grand Rapids Public Museum, which was surrounded by so many art installations. One of my favorites here was called ‘Sonder.’ The word ‘sonder’ means ‘the realization that each person and passerby is living their own uniquely complicated life that is as complicated as your own.’ The artist spent three years collecting quotes she overheard from random people. She then handprinted these quotes onto items of clothing similar to the people who spoke them. These were all hung up together, floating in the wind overlooking the Grand River. This installation really made me think… about the stereotypes we form about people based on what they wear, first impressions, what the installation said about the artist herself, etc. Wandering through ‘Sonder.’ I loved how interactive it was. We hit up quite a few other locations which I’ve linked in the map at the bottom of this post. I’ll also include some photos below for the curious ones among you! Honestly, a day was not enough and there were so many pieces we still didn’t discover! Of course I have to mention where to eat because… I’m me, right?! Plus, if you’re going to be exploring the city on foot all day you will need your sustenance. 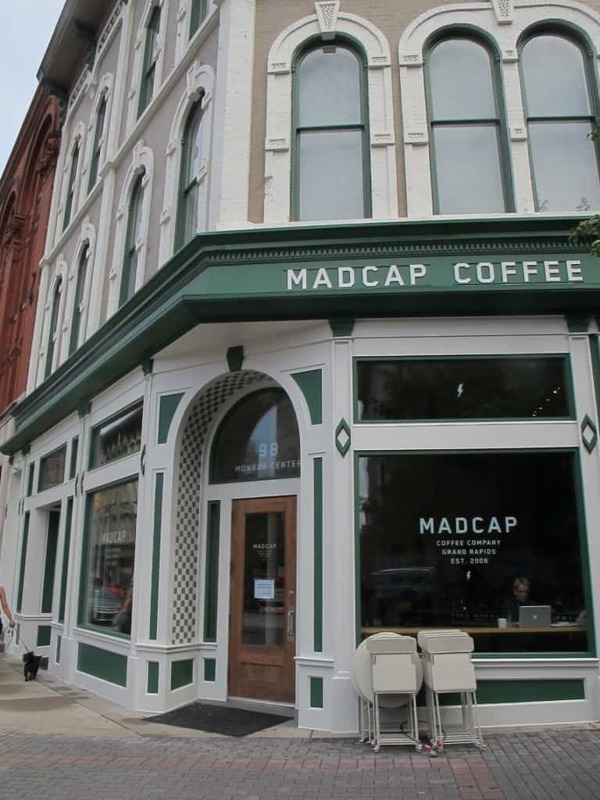 For coffee, you need to visit Madcap Coffee. This is a local Grand Rapids coffee company and has the best coffee I’ve ever tasted. Honestly, I’ve spoken to people from all over the world who have visited Grand Rapids and agree! They have amazing seasonal specialties… I enjoyed ‘fall leaves’ which was espresso mixed with chocolate, coconut milk, mulled vanilla, and cinnamon. Yummmm. Plus they have a location right by the Art Prize visitor’s tent! For lunch, you must eat at Marie Catrib’s, which is a drive out of the city center as it is located in the East Hills neighborhood… but oh, is that drive worth it. Marie Catrib’s is an eclectic Lebanese-American deli with the best sandwiches, salads, desserts, and deli items. They carry tons of vegan options, and to my joy, almost everything can be made gluten free (safely)! My recommendations are the reuben sandwich, paired with the trio of dips as a starter, and a freshly squeezed juice. From the deli, be sure to order the renowned duck-egg chocolate pudding. I’m actually a bit heartbroken to write this, but Marie Catrib’s is closing on October 20 of 2018. Marie passed away in 2013 and her son has been running the restaurant since then, but he is just ready for the next chapter of his life. Which is understandable… but I’m pretty sure all of Michigan shed a tear over that Facebook announcement! Anyway, if you are visiting Grand Rapids ArtPrize in 2018 I can’t give you any other recommendation than to go to Marie Catrib’s, before it’s gone forever! After this year’s ArtPrize I will update this post with some restaurant recommendations for next year. Everyone’s big question with ArtPrize is what walking route to take, and how to see it! ArtPrize is kind enough to put together multiple walking routes (which they paint onto the sidewalks in various colors), and you can pick up a map in the visitor’s tent. However, I wouldn’t recommend stressing about following a certain path. Personally, I think the best way to see Grand Rapids ArtPrize is to just wander around the city. If you are new to Grand Rapids, though, I have embedded a map below with some of the major destinations, such as the ArtPrize visitor’s tent in Rosa Parks Circle, where to eat, and some of the sites that usually house the best/most ArtPrize installations! When? Held in September and October. 2018 dates are September 19-October 7. How much? Grand Rapids ArtPrize is FREE! Plus during ArtPrize you get FREE access to museums (GRAM, Henry Ford) that usually require admission. You will only have to pay for parking, transportation, and accommodation if you require it. We had an amazing time at ArtPrize. I am kind of jealous because my mom is going back twice this year (it’s that good!). If you are in Michigan or the area (or want to hop on a plane) then I really recommend a trip to Grand Rapids for this very unique festival. Even if you don’t like art… the food is gooood too! *This post contains affiliate links. If you make a purchase through one of my links I may make a small affiliate, at no extra cost to you. This helps me with the running costs of this blog!